The civil war in Syria has resulted in government-controlled areas being deprived of domestic oil. Before the war, Eastern Syria produced 95 percent of the country’s oil. Today, Syrian government forces have been forced to source oil from external actors to power the country. Last week, the Trump administration exposed a complicated scheme involving companies and individuals in Russia, Iran, and Syria working together to transport oil to the necessary areas. Sanctions have now been announced concerning those accused of participating in this complicated Iranian-Russian plan to smuggle oil. This oil smuggling scheme has, allegedly, been in place since 2014, transporting millions of barrels of oil to war-torn Syria. Damascus, in turn, has facilitated the transfer of hundreds of millions of U.S. dollars from the Islamic Revolutionary Guard Corp’s Quds Force to Hamas and Hezbollah. Treasury Secretary Steven Mnuchin declared “Today we are acting against a complex scheme Iran and Russia have used to bolster the Assad regime and generate funds for Iranian malign activities”. The critical actor within this plan has been Mohammad Amer Alchwiki and his Russia-based company, Global Vision Group. 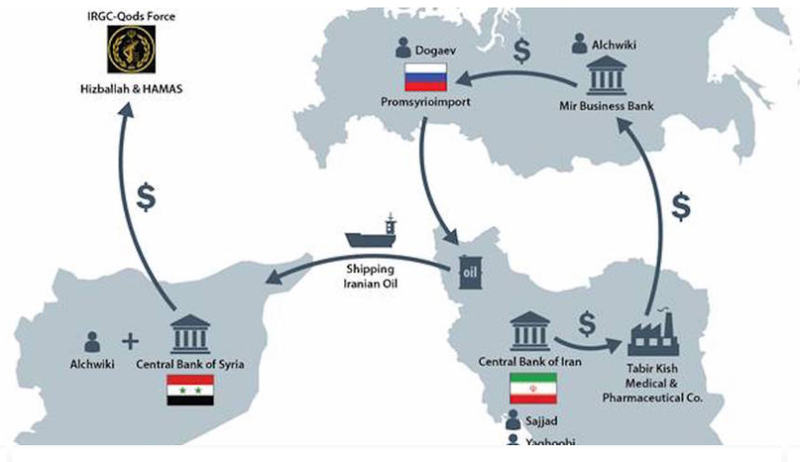 The Syrian national Alchwiki was central to both the delivery of oil to Syria and the transfer of funds via Iran’s Quds force to Hamas and Hezbollah. The source of the alleged ‘malign’ activities is the Central Bank of Iran (CBI) which provided the money. In order to conceal the source, the CBI apparently used Iran-based Tadbir Kish Medical and Pharmaceutical Company to transfer money to Alchwiki’s Global Vision Company. The companies both have a bank account at the Mir Business Bank in Russia which is a wholly-owned subsidiary of Iran’s Bank Melli. The front company is a ‘medical’ organization, meaning it adheres to humanitarian needs so that sanctions do not apply. In addition, Alchwiki has also acted as a conduit for Tehran to transfer money to proxies in the region. 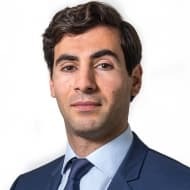 Using his international connections at the CBI and Mir Business Bank, he has been an interlocutor on behalf of the Syrian government. As with the oil scheme, the CBI played a central role by providing the necessary funds. It has been the Trump administration’s policy to confront Iran, and these sanctions are further evidence of that. The U.S. withdrawal from the Iran Nuclear Deal was the prelude of opposing Tehran in political, economic, and diplomatic areas. Washington’s success has been mixed. On an economic level, Washington has had more success in confronting Iran. After the signing of the Nuclear Deal, many companies showed a willingness to invest in the country. The reimposition of sanctions, however, made many companies reconsider their investment plans. Most notable of those companies was French energy giant Total which abandoned its massive South Pars LNG project. Although the U.S. has granted temporary sanction waivers to eight countries to import Iranian oil, it is highly unlikely these will be extended. The prime reason for Washington’s decision was its fear of increasing the price for oil by depriving the market of 1.5 million barrels of Iranian oil. Currently, Tehran is under pressure as the economy is failing and protestors are taking to the streets. Despite the difficulties Iran is facing, many analysts believe Tehran will be able to ride out the storm. Despite the recent drop in prices, the country is aided by relatively high oil revenues and the inability of Trump to form a united coalition as the Obama Administration managed with the previous nuclear agreement. These new sanctions will not have the desired effect of crippling the Syrian economy or depriving Assad support of Moscow and Tehran. It is likely that oil shipments will continue while the U.S. itself faces increasing pressure from a confrontational Turkey in Eastern Syria vis-à-vis the Kurdish YPG. Syria does not have a civil war. The war in Syria is a regime change war that was financed, armed, and staffed by foreigners including NATO, Israel, the USA, and the local dictatorships.